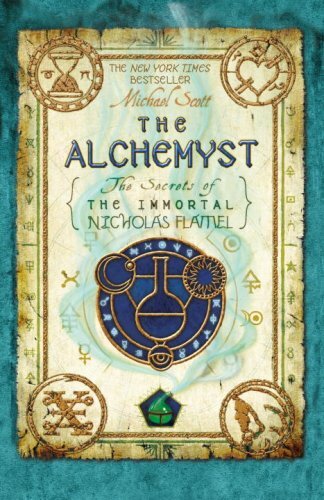 So, I recently mentioned that I was struggling with some of the characters in The Alchemyst, the first book in The Secrets of the Immortal Nicholas Flamel series by Michael Scott. Well, I’ve now finished the story, and…I didn’t really enjoy the story at all. There was the issue with the characters, as I mentioned here, but there were a few things with the writing that I couldn’t get over, too, things which just took away from my enjoyment of the tale being told. But, this is the first in a series. And, in the grand scheme of things, nothing has happened at the end of book 1. Yes, several events have occurred, and some major things have been put into action…but the rest of the series is still ahead, so a lot has not yet been accomplished. Which has led me to thinking about series, and not enjoying them. When you like a series, it is easy to read through it, at whatever pace…you want to know what happens next, and you are excited to revisit the characters and the world! But what happens when you’ve started a series, and you weren’t too excited about it…do you keep reading? If I think about my reading, I’ve definitely started a lot of series that I have not, at least to date, continued (or felt any desire to). I’m interested to know how others deal with this situation. If you’ve read a book that you didn’t enjoy very much, but it is part of a series, do you continue with the series anyways? How many books will you read in a series before you decide to give it up? Do you power through even if you don’t like it, or do you just forget it, and move on? It always depends on how much you dislike the book, and perhaps how long the series is. But generally speaking, do you read entire series? As for me and Michael Scott’s series, I don’t think I’ll bother. But there have been other series where, even a year or two (or more) later, I will continue give it another go by reading the next book along. And of course if I really like a series (like some of the major ones, such as The Hunger Games) I will read the books all at once. I found the Alchemist a hard drag to get through, and no, I never considered reading the rest of the series because of that. There are so many books to read – good books. I don't waste my time with things I didn't like. Yeah, I feel pretty much the same…there has to be a very special reason for me to read a whole series if I don't really like it! Funny, because I adored this book and bought the second yesterday! The one series that has really disappointed me is Ally Condie's. I thought Matched was great, but Crossed was so dull, I am in two minds about whether to buy the third. I couldn't get through this book either. I picked it up a few times, but it just didn't grab me. Of course, if I love a series, I can't read it fast enough. 🙂 Harry Potter, The Mortal Instruments, Chaos Walking and His Dark Materials were all awesome. Although, the last book in His Dark Materials was super slow in any parts that weren't about the MC's. there was a lot of info. we didn't need, but the books as a whole were still awesome.